Driving a motor vehicle is not as easy as it may seem. A good driver is the one who is steady, cautious, and perseverant. He has complete control over his vehicle at all times on the road. A bad driving experience can ruin your day. It can cause heavy financial impacts in the form of speeding tickets or damage to the vehicle or in the worst case scenario, lead to fatal accidents. Manoeuvring a moving vehicle on busy roads can be a dangerous business and therefore, below we have listed the top 5 good driving habits as well as the bad ones to keep in mind before you take the road. Who does not want to reach their destinations a little sooner? However, speeding increases the risk of getting a speeding ticket or worse, into an accident. More than 70% of the accidents which occur on roads are the result of accelerating the vehicle beyond specified limits. Regardless of whether you live in a city or by the countryside, it is imperative to regulate the speed of your car so that at any given point in time, you remain in complete control of it. 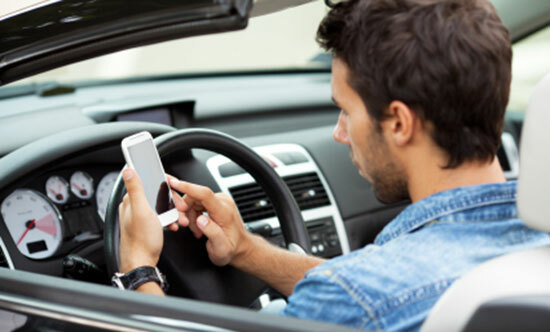 Using a cell phone while driving reduces reaction time by 20% at least. It is not just about using cell phones. Trying to juggle driving with eating, applying make up or even conversing with fellow drivers and passengers can increase the chance of causing accidents. Rocker Jim Morrison has advised to keep one’s eyes on the road and his hand on the wheel. Avoiding gadgets altogether is one of the good driving habits one can inculcate. Yes, tiredness is also one of the most prominent causes of road accidents. A little drowsiness may seem harmless in the beginning; however, it has been observed that accident causing drivers’ responses have ranged from simply falling asleep for a few seconds to totally zoning out and losing control of the steering wheel. Losing control for even a couple of seconds on the highway can lead to fatal accidents. The solution is easy. If you drive your car daily, ensure that you get proper sleep everyday before you begin the day behind the wheels. If you feel tired and dizzy at the end of the day, park your car somewhere safe and catch public transport to get home or ask a friend to drive you down. Similarly, if you are going through a trauma or any kind of mental disturbances in the personal or professional front, refrain from sitting behind the wheels. It is definitely not one of the good driving habits. Driving on icy roads is not easy. The best way to deal with this is to reduce the speed limit to about 10 or 15 miles per hour below the limit unless you stop feeling iffy. Black ice is also a menace and therefore, if you notice the headlights of your vehicle reflects on the road, slow down as much as you can. Ensure that there is a minimum of 80 to 100 yards of distance between you and the vehicle ahead of you. If your skids, gently turn the steering wheel in the same direction after you have taken your foot off the brakes. This way the vehicle is able to rectify the skid and straighten itself. Always turn on the fog lights during foggy days. Such good driving habits will take you a long and safe way. One of the foremost important aspect of inculcating good driving habits is to wear seat belts. They are important because they prevent the driver and the passengers from being flung around inside the crashing vehicle during an accident or worse, being hurled out of the vehicle through the windshield. More than half of the road accidents would have lesser impact on humans if everyone diligently wears their seatbelts, even if they are driving down to the nearest shopping mall. If your vehicle is equipped with air bags, it does not make wearing seat belts an option. Both air bags and seat belts together form the best way to protect the driver from fatal injuries during car crashes. Failing to indicate is considered to be one of the most prevalent and hated driving habits. How many times have we encountered less courteous drivers speeding turns without using appropriate indicators? Signalling to the fellow vehicles about the turns you intend to take in extremely crucial for the fellow drivers as well as pedestrians. No matter where you have to reach and how soon, refrain from accelerating through yellow lights. Indication of the amber light means that the traffic is either about to stop. This is the time when you should drive with caution in your current speed, prepare to slow down and stop the vehicle if the traffic indicator turns red. One of the good driving habits is to leave your house 15 minutes earlier if required else, wait for a few minutes at the signal. Such measures are better than causing sudden collisions with other vehicles. Inappropriate parking handicaps parking slots and causes chaos and difficulties for other drivers to drive their cars out. Moreover, chances are that you will be handed over with a parking ticket. Watch out for parking signs. Refrain from parking in front of emergency exit, schools, hospitals and theatres where a large number of people are likely to assemble. It is not one of the good driving habits to park in illegal areas. Refrain from parking in No Parking Zones, even if it is for five minutes. This is an important aspect of driving on highways. Driving at the same speed as the other vehicles will minimize the chances of crashing against each other. Use the acceleration lanes or the entrance of the highway to pace up and simultaneously, close attention needs to be paid to check the speed of other vehicles. Ease the vehicle only when you notice a substantial gap. Driving too close to the vehicle ahead creates annoyance and also increases the chance of collision by more than four folds. Ensure that you leave plenty of space ahead and if you are being tailgated, simply allow the vehicle to pass. Tailgating is one of most frustrating driving hazards and more than often drivers are found to practice it out of habit. Remember, sitting behind the wheels of a vehicle entitles you to look out for your safety as well as the fellow commuters and pedestrians. Irrespective of the accountability of an accident, it’s impact might befall on everyone around it. Inculcating good driving habits is imperative if you venture out on the road with a vehicle.